Not every bride is a “perfect 10”. In fact, sizes 14 and 16 are the two most common sizes ordered according to a bridal gown designer. This is apart of why Trudys has their annual Gorgeous with Curves Event and line. The “Gorgeous With Curves” line includes approximately 25 wedding gowns, in sizes 16 thru 26. Trudy has over 30 years’ experience in their salon, and has often heard customer’s comment on their sizes and shapes. Today’s fuller-figured brides are more common and of course simply want to look fantastic – just like anyone else. Yet these ladies usually assume that their options are limited to modest styles or those designed to conceal certain aspects of their bodies. 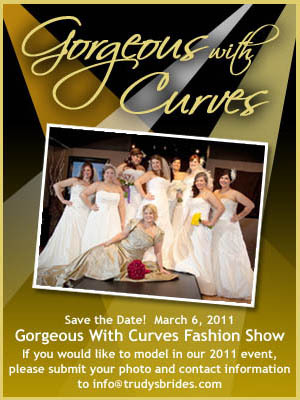 We want to celebrate curves, with Trudy and the rest of you Brides on Sunday March 6th, 2011 at the Pruneyard Plaza Hotel. There will be featured Bridal Gowns by MoriLee, Pronovias, Enzoani, Alfred Angelo, Casablanca, and many more.